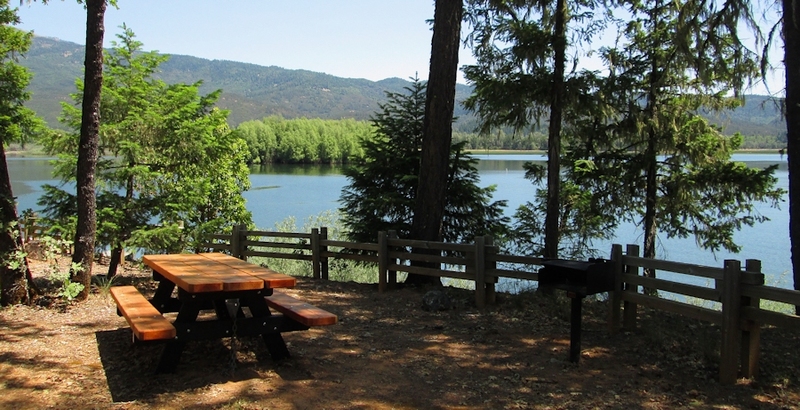 Lake Pillsbury, at an elevation of 1,832 feet in the north Lake County area, is open to all boating. Boat camping is allowed in designated areas. The lake’s 2,280 surface acres and 31 miles of shoreline provide plenty of room for boating, fishing, and swimming. Visitors to the area can also enjoy picnicking, hiking, backpacking, riding along U.S. Forest Service trails including the Back Country Discovery Trail, and hang gliding from Hull Mountain (elevation 6,873 feet) near the lake. Wildlife viewing is superb, particularly as there are herds of Tule Elk in the area. Access via Potter Valley takes about 1 1/2 hours from Lakeport, and a sturdy vehicle is recommended due to a long segment (at least 5 miles) of dirt road.